Clean Energy Asia LLC (“Clean Energy Asia”), together with its shareholders Newcom LLC (“Newcom”) and SB Energy Corp. of the SoftBank Group (“SB Energy”), announced that its 50MW Tsetsii Wind Farm located in the Gobi desert started commercial operations today on October 6, 2017. Mongolia faces significant challenges in meeting its growing demand for electricity, almost all of which is currently met by ageing and polluting coal-fired plants. The wind farm will help supply Mongolia's power demand with clean, energy-efficient electricity by harnessing Mongolia's vast and inexhaustible wind resources. The project will also help contribute to sustainable economic development and the mitigation of climate change. Clean Energy Asia commenced operations three months ahead of the previously scheduled launch date of December 2017. Mongolia has a power-supply capacity of 1130MW, consisting of 88% coal, 6% diesel, 6% renewable energy, and 2% hydropower sources (according to the Department of Energy, Mongolia, 2015). While being the world’s eighth country most susceptible to climate change (according to Germanwatch’s “Global Climate Risk Index 2014”), electricity supply-demand balanced with its economic growth is an urgent issue for Mongolia. Accordingly, Mongolia is a country that particularly requires safe and secure power sources such as renewable energy. The State Great Khural approved a national power policy in 2015 that sets Mongolia’s mid-to-long term target and plan for 2015-2030 in the energy sector. The policy aims to increase the power generation share of renewable energy to 20% by 2020 and to 30% by 2030, and it stipulates the promotion of investment in the energy industry in cooperation with international financial institutions and donor countries, utilizing the abundant wind and solar resources in the Gobi region. Mongolia is the first country to sign a memorandum with Japan on the Joint Crediting Mechanism (JCM) to reduce greenhouse gas emissions and this project was eligible for JCM application through Japan’s Ministry of Trade, Economy and Industry (METI) at the feasibility study stage. In these circumstances, this Tsetsii Wind Farm project can help contribute to the increased adoption of renewable energy in Mongolia. This wind farm project is the first dollar-denominated project finance debt transaction by JICA through its Private Sector Investment Finance scheme in the renewable energy field, and also marks the first power generation business in Mongolia for SB Energy and the SoftBank Group. “The SoftBank Group started renewable energy development in Mongolia to realize our multinational power grid plan called the Asia Super Grid, first announced in 2011. I’m very pleased that the commercial launch of the Tsetsii Wind Farm marks the first step for the SoftBank Group to establish a renewable energy business in Mongolia under the Asia Super Grid project, in addition to India and Japan. “This project represents the first stepping stone for renewable energy expansion in Mongolia and also for our Asian Super Grid project. With SB Energy’s knowhow in the Japan renewable energy market and our partner Newcom’s cooperation, we were able to complete our first successful project in Mongolia. “The successful completion of Tsetsii Wind Farm project this year and Mongolia’s first wind farm Salkhit in 2013 are testaments to Newcom’s vision in being the pioneer in innovative technologies in Mongolia. We are proud to have led the development of renewable energy sector in Mongolia and we are proud to introduce and grow our partnership with the SoftBank Group through this pilot Tsetsii Wind Farm project in Mongolia. We would like to sincerely thank everyone who contributed to our project including our co-developer SB Energy, our financial partners EBRD and JICA, Mongolian government authorities, and all the workers who committed their time and effort to this project. Thanks to everyone’s best efforts our project was finished well ahead of the initial planned schedule. During the peak of the project’s construction period, we had over 400 workers and more than 95% of those workers were Mongolians. This is a clear proof that Mongolian professionals are talented and skilled enough to complete a world class project. Clean Energy Asia LLC (CEA) was established in 2012 as a joint venture between Newcom LLC and SB Energy Corp., the renewable energy arm of SoftBank Group Corp.
SB Energy is a subsidiary of SoftBank Group Corp. and one of the leading renewable energy companies in Japan. As of October 2017, it had over 408.5MW of power in operation with 34 plants (equivalent power needed to supply approximately 128,180 households in Japan). SB Energy is aiming to spread and expand the adoption of renewable energy derived from natural sources, such as large scale solar power generation (Mega Solar) and wind power generation. Newcom is a Mongolian clean technology and infrastructure investor committed to bringing global expertise and innovation to Mongolia. Newcom Group has a diverse portfolio of investments across telecommunication, information technology, financial services, renewable energy, real estate and mining services sectors. 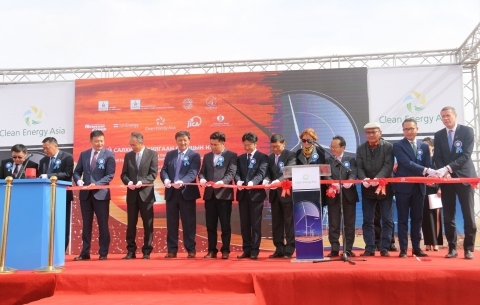 The company operates Mongolia’s first wind farm, with capacity of 50 MW and located 70km from Ulaanbaatar city and is in the process of developing the 450 MW combined heat and power plant #5 as part of an international consortium awarded the concession agreement by the government. The company’s headquarters are in Ulaanbaatar, Mongolia. For more information, please visit www.newcom.mn.